Watching a good movie a second or even a third time can be extremely rewarding. Characters’ motives become clearer, missed details emerge out of the background, and plot line subtleties take on new meaning. Believe it or not, the same can be said of hydraulic fracturing in unconventional basins. As operators review their ever-expanding libraries of hydraulic fracturing data, they are discovering details that are leading to new understandings of how to optimize stimulation treatments and boost productivities on a stage-by-stage basis. The goal remains unchanged–creating flow conduits that connect the lateral to the reservoir–but the industry’s experience base in resource plays continues to redefine both best practices and best-in-class technologies. The focus is on deploying advanced perforating systems, downhole completion tools, and proppants and other components to improve the efficiency, cost and operational safety associated with multistage completions without compromising wellbore integrity or treatment effectiveness. And even though the industry still is transcending the learning curve in unconventional reservoirs, the sequels are being scripted. Operators of all sizes are seeking to deploy many of the essential tools and techniques pioneered in tight oil and shale gas development to a diverse set of applications, including stimulating ultradeepwater wells in the Gulf of Mexico Lower Tertiary trend, fracturing/refracturing conventional shallow vertical wells in mature onshore fields, and ultimately, ushering in comprehensive refrac programs in horizontal resource plays. “Early on, the industry used the traditional approach of fracturing in regular intervals of so many feet, because in a conventional reservoir with moderately high permeability, all those fractures could be expected to produce,” recalls George King, a distinguished engineering adviser with Apache Corp. “Today, many operators are looking for engineered completions that target the rock with the greatest potential for natural fractures, and avoid rock with low potential or geohazards. Toward that end, operators are identifying proppants that are more easily carried by slickwater and dispersed throughout the contacted area, King says. He expresses confidence that completion designs will continue to improve, citing the industry’s past accomplishments. “Since the 1990s, we have moved from being able to recover 1-2 percent of the total gas in place in an unconventional reservoir to 20-40 percent, with the exact amount depending on the permeability of the shale and the effectiveness of the completion,” he reports. 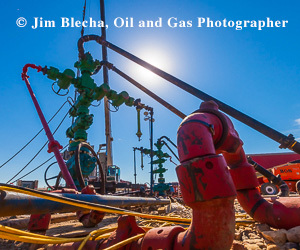 In oil shales, the recovery rate has increased from 1.0-1.5 percent to 5.0-8.0 percent. King suggests further improvements can be achieved by researching flow physics and deploying additives traditionally seen as secondary flow improvement solutions. As technology improves, King predicts a growing number of wells will become candidates for refracturing. “Refracturing older wells that were completed initially using foams and cross-linked gels with slickwater or hybrid fracturing fluids has given tremendous improvements in flow. Often, wells that have been producing three or more years flow at higher-than-ever rates after refracturing,” he says. Today, many wells are being designed with refracturing in mind. King says well integrity is a big part of that effort. “As we apply cyclic stresses on cemented-in casing during refracturing operations, we can create leak paths, so we need to use good pipe joint technology and cements that can withstand the cyclic application of pressure,” he says. Refracturing operations have yielded mixed results, King allows. “For the industry to perfect refracturing, it needs to move from a single-well approach to a ‘campaign’ approach. Instead of refracturing a single well, commit to five, 10 or 15 wells and learn from each,” he advises. Guardian Global Technologies has introduced an integrated system for placing, firing and removing perforating guns that includes everything from an addressable release tool to a gamma ray and collar locator. The company says the system increases perforating operations’ safety and efficiency by reducing the chance of mistakes. Coiled tubing frequently is deployed to get guns to the right depth, but because traditional wireline deployment generally is more time and cost efficient, most operators prefer to use wireline. “To get wireline tools on bottom, the operator needs to move them along the horizontal lateral where gravity is an enemy rather than an aid. As a result, the guns must be pumped down, sometimes with help from a tractor,” he notes. “Once the tools are on bottom, the operator has to rotate an extremely long set of guns–often in excess of 1,000 feet in length–so they can fire in the optimal stress direction and avoid shooting through external control lines. Friction and gravity combine in this situation, so the swivel that turns the guns needs to be powerful,” Keenan says. “With the BDS, the cable head tension tool monitors compression and tension loads on the cable to help optimize running speeds while running in and pulling out of the hole, particularly during pump-down operations,” Keenan continues, noting that this gives the operator better control of the line speed. Keenan describes the integrated system as addressable. “Our customers, the wireline companies, can communicate with the Guardian tools, so they can control exactly what is happening to the string and the guns,” he says. “Minimizing the opportunity for human error has been a major goal throughout the system’s design,” says John McGrath, Guardian’s director of sales and marketing. “We have achieved that goal partly through automation. For example, the Select Fire Switch (SFS), which controls when the guns fire, automatically identifies the detonator that is in each gun in order to activate at the appropriate intensity and current. “Because the SFS is part of the system, Guardian is able to implement additional safety and reliability protections,” McGrath continues. “The system will not allow the switches to fire until the gun has reached its designated depth, which prevents off-depth perforating incidents, which in turn saves lives,” he says. Shaped charges play a key role in effective completions, says Nathan G. Clark, the senior vice president of perforating and technology for GEODynamics. “In most applications, our goal is to design shaped charges that create a large, clear tunnel. If we can do that, we will maximize production,” he comments. GEODynamics reports that perforating charges with its reactive technology (top), which generates heat and mechanical energy after the perforation event, create longer and clearer tunnels than conventional charges (bottom). Creating effective tunnels is far more difficult in practice than in theory, Clark says. He points out that many operators evaluate charges based on American Petroleum Institute tests, which are done on unstressed cement targets with a minimum compressive strength of 5,000 psi. To ensure its shaped charges will be effective, Clark says GEODynamics tests its charges by stressing cores that resemble the rock the client expects to perforate. “By simulating downhole conditions, we are able to look at the effects of shooting in a balanced, underbalanced, or overbalanced perforating environment,” he adds. Penetrating deep into the rock is only half the battle. “We want a clear tunnel,” Clark says. “If the total penetration is 10 inches, but seven inches of the created tunnel are plugged with debris, the effective penetration is only three inches. “To clean the tunnels, our charges use patented reactive materials. After the perforating event, these materials create a bimetallic reaction that generates thermal and radial mechanical energy in the perforating tunnel. This energy disrupts the formation of compacted rock during the penetration event, allowing natural pressure surges to clean out the tunnel,” Clark relates. The clean tunnels and fractured tips can eliminate the need for the post-perforation acid jobs often used to remove debris from the tunnels before pressure pumping, Clark adds. “This saves a tremendous amount of time and money while reducing health, safety and environmental risks,” he says. In North American shale plays, the reactive technology has improved initial production rates and eased decline curves, Clark reports. “In natural completions in the Middle East, we are seeing productivity three times higher than the previous best wells in the field,” he remarks. While expressing pride in the reactive charges’ accomplishments, Clark says they should be viewed as part of a bigger system that includes the entire gun assembly. “We design systems that have the right shot density, the right phasing, and the right charge for the application,” he says. “A charge phasing and shot density design intended for vertical wells does not make sense in horizontal prefracture perforating applications. Furthermore, with traditional perforating systems, the location of the fracture initiation, and the number of perforations that feed the fracture in a given cluster vary unpredictably. Today’s commodity price environment has sharpened operators’ focus on efficiency and reliability, says Joe DeGeare, the U.S. president of NCS Multistage. “Operators want to know they have done everything possible to complete the well effectively, which means placing each stage exactly where they want to place it,” he adds. With NCS Multistage’s sliding-sleeve completion system, operators complete each stage individually, not in clusters. In addition to reducing hydraulic horsepower requirements, this single-point injection approach can increase production, the company reports. By eliminating the need to use and remove plugs, DeGeare says the system saves time. “How much time depends on the stage count, but in the Bakken, we have done 60-70 stage completions in three to four days that used to take one or two weeks,” he reports. Because the system completes each stage at a single point, instead of several clusters at once, DeGeare says water can be pumped at a much lower rate, reducing required horsepower by two-thirds. During the completion, the coiled tubing acts as a dead string that transmits real-time pressure information to the surface, DeGeare notes. “With true at-zone pressures, the operator can see when the formation stops taking the proppant and respond to prevent a screen out,” he comments, adding that excess sand from screen-outs can be quickly circulated out of the well by pumping down the coiled tubing. In response to growing interest in refracs and recompletions, NCS introduced a new version of the system’s sleeve that can be opened and closed multiple times. “We can go back in the well and close sleeves as needed to re-establish wellbore pressure integrity so the operator can perform an effective recompletion,” DeGeare says. He says the sleeves also can be closed if the operator is seeing problems during production, such as a zone watering out. DeGeare says the sleeves have a full-bore inside diameter, which means they will not restrict completions or recompletions. He adds that the system supports high-stage-count jobs, with the only limit being how far coiled tubing can reach. “As operators drill longer and longer laterals, it has become more difficult to run casing all the way to the bottom of the wellbore,” DeGeare says. “NCS saw a need for a new kind of float-in system that could help overcome friction between the pipe and formation. After casing is landed, increased pressure fragments the seal, leaving a full-drift wellbore. Seal fragments are captured by a debris collar, and circulation and cementing proceeds as usual, DeGeare describes. The system has enabled some operators to run casing in previously impossible wells, but DeGeare says an additional benefit is saving time. “In many applications, we have been able to cut two days off the time it takes to run casing to bottom,” he reports. DeGeare adds that the buoyancy system also can eliminate the need to rotate the casing. “If well conditions permit, operators can change from premium connections to lower cost standard connections,” he notes. This degradable frac ball is made from a composite polymer with exceptional tensile strength. Manufacturer Bubbletight says similar polymer technology is enabling completely degradable frac plugs, diverter balls and diversion powders that are reliable and effective. Rosenholm says that goal will soon be achievable. He points out that degradable technology has proven successful in a range of applications, from frac balls to plugs for zonal pressure isolation. Degradable polymer powders can be applied along with degradable diverter balls to plug existing perforations during a refrac, he adds. “The powder is pumped down with the fluid, where it packs off existing fractures for hours or days, then degrades to allow the fractures to re-open. This tool can increase the effectiveness of diverter balls, and the combination of the two may be less expensive than mechanical alternatives such as bridge plugs,” he says. Rosenholm adds that DCP offers a tensile strength of 20,000 psi, some 4,000 psi higher than PGA. Tensile strength generally correlates with all three qualities, but there are materials that have a high tensile strength but poor downhole performance, Rosenholm warns. He says the characteristics an operator should look for will depend partly on the application. “In a hot environment, the operator may want a product with a high modulus, because it may soften less quickly,” he illustrates. For plugs, ductility/malleability and compression strength can be important, Rosenholm says. He recommends operators also look at the plugs’ sealing elements. To provide faster degradation, Bubbletight has developed a sealing element made from a version of the plastic used to make DCP. “We can tailor the material to degrade anywhere from a day to a month, and the material can be molded and extruded net-shape,” Rosenholm reports. For high-temperature or high-pressure applications, Rosenholm recommends using a metal-based degradable. “Good degradable metals cost more than polymers, but they do not soften and deflect as quickly, so they have better performance,” he explains. Bubbletight manufactures degradable composite metals (DCM), which Rosenholm says are stronger than degradable alloys or cast products. “Our unique manufacturing process allows magnesium and other reactive elements to be combined without being re-melted. As a result, the DCM material has superior strength without compromising the degradation characteristics of the reactive elements,” he relates. The Lower Tertiary Wilcox trend in the Gulf of Mexico holds great promise, but to tap it, operators need completion systems capable of withstanding extreme pressures and temperatures. Baker Hughes says it is meeting that need with an ultradeepwater integrated completion and production system. The company points out that it developed the system in only three years by forming an integrated, 95-person team and using a Six Sigma design process. The process started with research to gain an in-depth understanding of customer requirements, recalls Robbie Pateder, the team’s senior director. “We gathered information from customers and consulted with Baker Hughes’ reservoir development services team to build the basis of design for what the completion system had to do,” he says. “From that research, we knew the system would need to withstand bottom-hole pressures as high as 25,000 psi and temperatures as great as 300 degrees Fahrenheit,” he relates. “In addition, each well in the play would cost at least $400 million, so we had to deliver production and recovery rates high enough to make that investment worthwhile. Because the target formations had extremely low permeabilities and porosities, the system would need to deliver unprecedented treatment and stimulation programs. “We wanted it to be able to deliver 5 million pounds of proppant and pump fluid at up to 50 barrels a minute to address these formations,” Pateder adds. With development costs being so high, the system had to improve the net present value of these projects significantly, Pateder notes. The team determined that most Lower Tertiary projects targeted three to five zones, steering the economics toward completing multiple zones in a single trip. And the wells needed to produce at optimal rates throughout their entire life cycles to deliver the recovery rates required for economic development, he adds. After three years, a 95-person product development team at Baker Hughes has introduced an integrated subsea completion system for the ultradeepwater Lower Tertiary Wilcox trend in the Gulf of Mexico. According to the company, the system offers completion and reservoir management capabilities that will enable operators to maximize the value of each well. Reliability over a long production life under extreme conditions was another key consideration in the system’s design, Pateder says, noting the materials required to deliver the 15,000 psi pressure differential bolstered the system’s safety. “We have very, very high ratings for burst and collapse, and we are using NACE-compliant materials in the wetted areas to give operators the assurance these wells will last as long as 20 years,” he reports. From operator feedback, the team knew the wells might require flow assurance treatments. Pateder says the system can inject asphaltene and hydrate inhibitors into the well as needed to keep production flowing at optimal rates. The team also learned that well surveillance is a key driver for operators. “By monitoring and detecting changes in temperature, we can detect events such as water breakthrough and hydrate plugs. The goal is to give the operator ‘eyes’ into the performance of the well so he can update reservoir models, take steps to improve production, and maximize the long-term value of each well,” he explains. Pateder points out that the integrated product team included not only engineers, but also quality assurance, supply chain reliability and operations professionals. “As we designed the system, we wanted to make sure we could mitigate the risk associated with delivering the product, building it, and operating it in the field,” he explains. Toward that end, the team had the engineers work for a standard list of materials. “On a part-by-part basis, this might mean we pay more. However, we have ready access to materials that would often otherwise require a mail order, which seemed appropriate for high-risk projects,” Pateder says. The Illinois Basin may not have been blessed with an equivalent of the Bakken or the Marcellus, but small independents with a knack for geology and cost control continue to drill profitable wells there, says Jerry Robinson, technical manager for Franklin Well Services Inc. An effective completion program is often key to these wells’ productivity. As operators have come into the Illinois Basin to test the Mississippian Lime and other formations, Franklin Well Services has added larger pumps to its hydraulic fracturing fleet. The company says these pumps join smaller vehicles that are used to complete and periodically refracture the basin’s many conventional wells. Checking well integrity is vital before a refrac, Robinson notes. “With all the water we produce, we have to watch for corrosion and make sure the casing and the cement still are good,” he says. Although he admits that the Illinois Basin is often one of the last areas to deploy emerging technology, Robinson says understanding technology, best practices and operating procedures has played a key role in Franklin’s growth. As operators have come into the basin from other areas to test the Mississippian Lime, Franklin has expanded its fleet to handle larger frac jobs. “We have eight 2,500 horsepower pumps to do the bigger jobs,” Robinson details. He says that may involve 200,000-300,000 pounds of sand and an average pumping rate of 50 barrels a minute.